The Human Resources Module tracks empolyee data, counseling records, workers compensation, performance evaluations, or any type of benefit and much more. HR directors can quickly verify that employees have electronically signed the system-generated acknowledgements, which helps with federal regulations compliance. The system also automatically alerts empolyees of benefit eligibility based on their eligibility date. Another unique time saving feature is the hiring management system. A custom employment application is linked from your website directly to Intelidy. It includes a pre-screening feature for administrators. Managers can view applications and resumes, schedule interviews, and make notes. 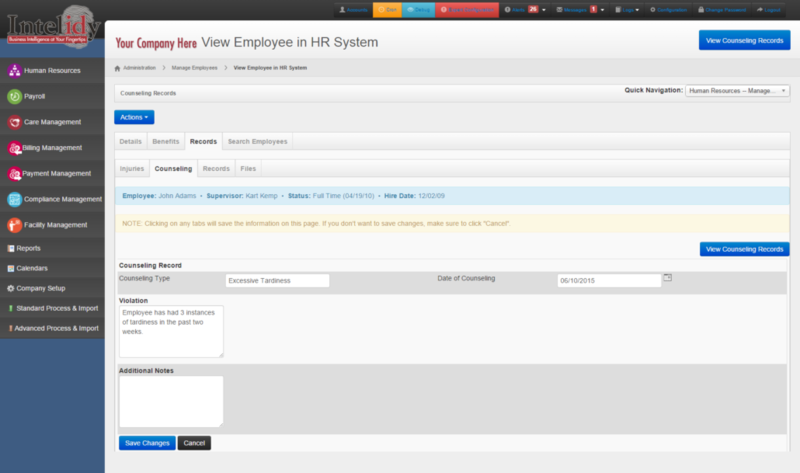 Tracking applicant flow and hiring employees has never been easier. Intelidy’s comprehensive human resources information system will greatly improve business performance. 1095C’s are automated through the system, which saves a tremendous amount of time in complying with Affordable Care Act directives.